You are here » frostvalley.org » Group and Family Programs » Lakota, Outpost, and Thunderbird Challenge Night! Lakota, Outpost, and Thunderbird Challenge Night! 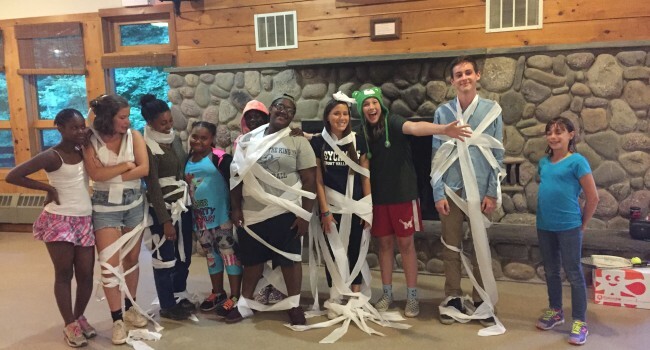 This picture was taken after the “mummification” challenge, in which a camper tried to wrap their counselor in as much toilet paper as possible in the allotted time. Challenge Night is a Frost Valley staple, run by Al Filreis! The campers and counselors are given different challenges such as smelliest shoe, this mummification challenge, or best dance moves! All of the campers had a blast!